Situated on land which is part of the family homestead, County Shores is 22 acres of mowed grass, mature trees and streams landscaped with shrubs and perennial flower beds providing colourful displays through-out the season with the Bay of Quinte in the background. We have 30 amp, and 15 amp electric and water sites available for the RVer or tent camper who requires it as well as Non-Serviced Sites, see our Rates and Packages page. We also have a limited number of pull-through sites for those bigger rigs that don’t reverse easily. The electric sites are located closer to the office store and washrooms while the non-service sites offer more privacy and shade and are closer to the shoreline. None of our sites have sewer hook-up but we have a free of charge mechanical dump station and also offer an on-site pump-out service for a nominal fee. Public washrooms and coin operated showers are located adjacent to the store and office for the use of all in the park 24 hours a day. We feature a playground area for children with swings and slides. Horseshoe pits, Ladder golf, and Tetherball are here for your enjoyment. There is plenty of open space for a game of soccer, volleyball, Frisbee, or catch. Many quiet roads in the park offer a chance to ride your bike or go for a leisurely stroll or a brisk evening run. Bring your camera for great photo shoots of the spectacular sunsets. All campsites have a picnic table and fire pit and the water and shoreline is visible from all of our sites. 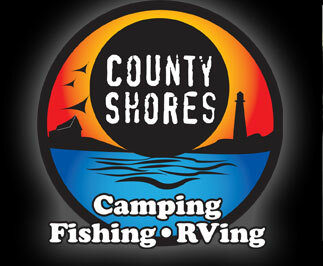 County Shores has Camping Trailers for rent nightly or weekly that sleep 4 to 6 people. These trailers are equipped with a fridge, stove and sink. These trailers are ready & set-up on campsites when you arrive. The trailers provide a great alternative for the camper or angler that does not have camping equipment and wants to stay close to the action or have the "RV Experience". 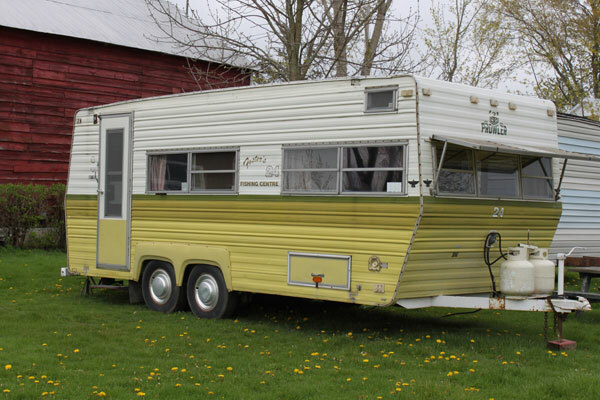 When renting one of the trailers you will need to bring your own bedding or sleeping bag, towels and linen. Things that are also nice to bring are: an outdoor barbecue, lawn chairs and a sun shade or picnic shelter. All our trailers are equipped with Electric Heater, Coffee Makers, Cutlery, Dishes and basic cookware. Some units are now available with Air Conditioning. See our Rates and Packages page for more details on each trailer available. The 3 bedroom Vacation House overlooking the Bay of Quinte, is a must see! Customers are raving about how private and convenient it is, with its own access to Cty Rd 15. Once lived in by the owners, the House features a back deck with water views, a 3-piece bathroom, full kitchen with dishwasher, satellite TV and BBQ. It is open year round. Click on the image for more photos and details. County Shores is pleased to offer a fully contained 3 bedroom suite. It features a full 3 piece bath, full kitchen with wall oven, counter top stove, fridge, dining area and living room equipped with satellite TV. There are 2 queen size beds and one double bed for sleeping in the bedroom area. It is on the main floor and has a patio area with a BBQ. 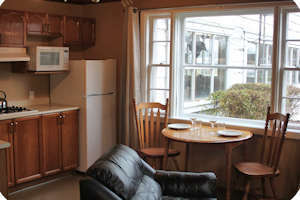 This unit is available year around for both summer and winter vacation getaways to the County. Click on the image for more photos and details. 1 Bedroom, Sleeps 2. Available Year Round. Features: Fully contained 1 Bedroom Suite with 1 Queen Sized Bed, Full Kitchen (except oven) and Bath, Living Room equipped with Satellite TV, Dining Area, and Main Floor Walk Out to Patio Area with BBQ. Amenities: Air Conditioning, Full 3 Piece Washroom, Counter Top Stove, Fridge, Satellite TV, Coffee Maker, Microwave, Dishes & Cookware. Click on the image for more photos and details. County Shores offers a Private Cabin by itself close to the shoreline. This accommodation is very popular with larger groups of anglers that visit us. It sleeps as many as 10 people but is best suited for 6 to 8 adults. This is a rustic cabin with few amenities but offers the best views of the Bay of Quinte and is one of the most private locations on the grounds. People using this accommodation have to use the main washrooms as there is no washroom within this accommodation. See our Rates and Packages page for more details. County Shores offers a "Store and Camp” option for those who want to stay with us often but don’t want the hassle of towing their unit to and from the park. With "Store and Camp” you pick out three sites in the park that you like. You then bring your trailer and leave it for us to store throughout the season. When you would like to come camping you simply contact us and we will move your trailer to one of your chosen sites prior to your arrival and you simply set-up and move-in when you arrive. No big gas bill to get here and no having to back into your site after dark. See our Rates and Packages page for details. County Shores is now offering a seasonal option. Our Seasonal Camping package offers the camper or RVer the option to leave their camper or RV set-up on a 30 amp electric and water site from June 1 until October 15. Weekly holding tanks pump-outs are included in the fee. Contact us for more details. Seasonal site space is limited, no decks are permitted. For those tough and hardy RVers looking to experience Prince Edward County or The Bay of Quinte in the Winter months please contact us. We turn the campground water system off from Oct 31 to Apr 15 but we can still get you a site with electricity. We also have winter washroom and shower facilities for your use. Many anglers fishing the Bay during the winter months use this option.